ECS Southeast, LLC is pleased to announce the opening of their newest office located at 133 W. Oxmoor Road, Suite 205, Birmingham, AL 35209. This is the first office in Alabama for the company. Mr. David Marsh, PE is the branch manager. He has 10 years of experience in engineering and project management as well as local experience in the market. Mr. Marsh lived in Birmingham for six years and earned his Master of Engineering in Construction Engineering Management in 2008 from University of Alabama- Birmingham. He moved back to the area in March from Asheville, NC, where he was a senior project engineer for the local ECS office. 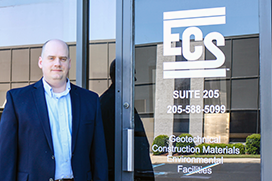 ECS is now hiring field technicians and engineers in Birmingham. For more information or to apply please visit http://www.ecslimited.com/career-engineering-consulting.